The heart of the Amaya Gaming company is located in Montreal, Canada. In the last couples of years, the company has grown and established its name as a prominent manufacturer. On their list, there are more than 100 different games, where gamblers can win the real money or the demo coins. The free online Serengeti Diamonds slot machine is one of such Video Slots that is available directly through a browser, with no download. The machine consists of 3 rows, 5 reels, and 25 paylines, and is popular all around the world, especially the UK. 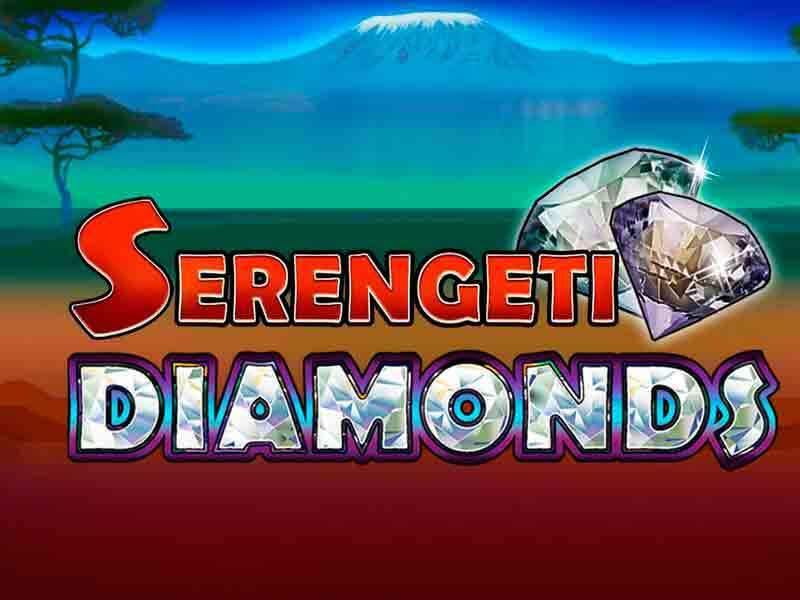 The Serengeti Diamonds free slot game is designed for any players because there is the possibility to bet on different betting levels. Also, because of the additional bonus game, which provides various numbers of free spins and multipliers, so that profits can be increased even more. The RTP for this pokie is 97%, which is a pretty decent percentage for Online Free Slots. This casino machine consists of ten regular symbols 9, J, Q, K, A, a mask, a cottage, an elephant, a lion, and two bonus symbols. It is the best card in this machine with the mountain logo in the background; it can substitute all symbols except the Diamond card (scatter). It is the Diamond card, and players need to obtain it on all five columns so that the additional round can be activated. However, if a player receives this card only on the two first columns, the regime “Hold n Spin” is on. This mode will start on the first two locked columns, and you will get the chance for three re-spins. The Jewel card needs to land on any of remaining columns in 3 attempts. If you get Scatter in these attempts, then you will get the possibility to obtain all five such icons. However, you don’t manage to get at least one, the “Hold n Spins” regime will end after three attempts. Gamblers will have the chance to choose between 10 rubies. Behind five rubies, there is a different number of free spins: 5FS, 8FS or 10FS. Behind the other five rubies are multipliers: 3x, 5x or 8x. After selecting the rubies, gamblers can collect the reward or replace it if they are not satisfied. During this extra round, the additional number of Free Spins can’t be triggered. In the Serengeti Diamonds slot machine game, bettors can adjust the stake on different levels. Lines: The pokie has 25 paylines. Bet Per Line: Its range is from 25 coins per line up to 250 per line. Credit Value: The minimum credit value is 0.02, and the maximum is 5.00. While bettors play free Serengeti Diamonds casino slot machine, they can’t win a progressive jackpot. However, because of the possibility to play the pokie on the high betting level, gamesters can collect rewards similar to the high-valued jackpot prizes. Moreover, the machine has a function for AutoPlay, where gamblers can adjust the machine to spin the particular number of times. If you wish to try out more slots with AutoPlay, search for Jungle Monkeys, Buffalo, or The Hulk on our website! 0 responses to "Serengeti Diamonds Slot"